The Numbers are Tallied for 2018! The total number of animals assisted by The Animal Support Project in 2018: 345! The number of owned animals assisted: 300! The number of animals admitted to the TASP foster-adoption program: 45! 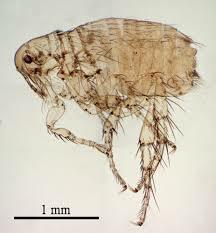 Species served by TASP in 2018: Cats, Dogs, Rabbits, Rats and Ferrets…….What? No Centipedes? Well, maybe next year! 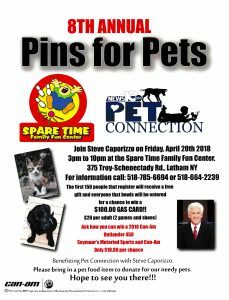 SATURDAY, APRIL 20, 2019, starting 10AM: The first TASP PAWS2PROTECT event takes place at Troy Area United Ministries, 392 2nd St., Troy, NY 12180. Low-income dog owners in Troy should visit our Events page for details. 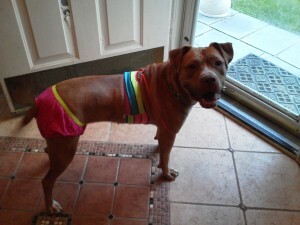 Sadie’s Foster Mom decided Sadie is too good to give up, so Sadie will now be Lucinda’s dog for life! CONGRATULATIONS, SADIE! This means we are still seeking homes for ONE! of Mitch Valerien’s dogs. We’re also now in need of a new TASP foster home, now that Lucinda’s home is complete. Thanks to the kindness of our community, Midnight, Andy, Billie, Ben, Zach and now, Sadie! have all found loving homes. 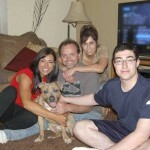 That leaves just Mallory still in foster care and hoping for a permanent home. PLEASE CLICK HERE to view the video and learn how you can help. 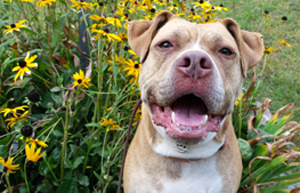 Details on Mallory can be found on the Adoptable Animals page of this website. Big shout out to all our TASP Volunteers and Supporters who worked, donated to and/or shopped at the big TASP Labor Day Tag Sale. With this being our 10th year of doing what we do, we have, let’s just say, a VERY loyal crowd of folks who look forward to playing “Let’s Make a Deal” on over a thousand square feet of quality donated items that TASP volunteers have been collecting and storing for months. And this year, as in previous, generous animal-loving people pulled up to our tents all weekend to drop off even more great stuff! Everything we earn at all of our fund raisers is committed to keeping pets and families together, and so the good vibes from knowing this are what keeps people tuned in to our mission. 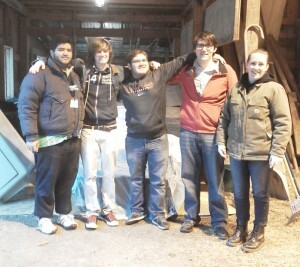 THANK YOU, Whalen Tent of Troy, NY for letting us borrow your incredible tent! THANK YOU, Out of the Basement for letting us squat for free on your grassy knoll at Sterup Square for the weekend! THANK YOU, local peeps who brought goodies, shopped goodies, and kept all of us laughing and smiling all weekend and THANK YOU, TASP Volunteers for making it possible to throw such a big event so successfully for this and so many past years. With a team like ours, the critters just can’t lose! HEY! Memorial Day will be here before you know it and you know what that means, right? ANOTHER TASP TAG SALE IS ALREADY BEING PREPARED! If you have gently used or new items that could help TASP earn the funds that save lives and keep families together, please give us a call/text/email. Local families and their animals are counting on us! Petapalooza at Curtis Lumber was a hoot and a half this year and many of Mitch’s dogs were there to meet and greet potential adopters. Thanks to Bill and his family, Mitch’s Zach is now Bill’s co-pilot. 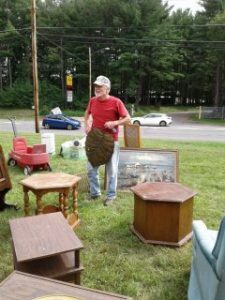 Here’s a shot of him working the crowd at Bill’s recent garage sale…..
What a team those guys are! Thanks, Steve Caporizzo, Pet Connection and Curtis Lumber for opening doors and hearts for so many deserving animals! The Mohawk Honda Adoption Day was tail-waggin’ fun and we even came home with some adoption applications! 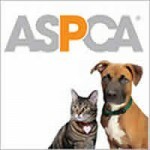 Visit our website’s Adoptable Animals page to view who’s not yet adopted. Your next best friend could be waiting there! 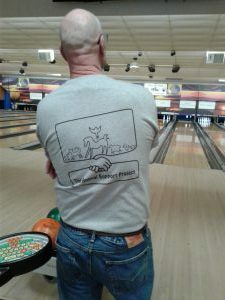 THANKS to all of you who came out to support local animal rescues (including TASP) at the 8th Annual Pet Connection Pins for Pets Bowling Event at Spare Time Family Fun Center on April 20. The place was jam-packed with bowlers, raffles, well-wishers and even people dressed in strange animal costumes! So much fun and so heart warming knowing how many folks cared enough to participate! THANK YOU, DONORS AND SHOPPERS! THE TASP MEMORIAL DAY TAG SALE WAS A BIG SUCCESS! The TASP Memorial Day Mega-Tag Sale earned local pets over $2,500! Thanks to our community’s generosity we had four incredibly great days. Even on rainy Sunday, brave hagglers made it to the big white tents where everything remained dry and available. All proceeds are used for our mission of protecting animals and their owners through tough times, so it was particularly heart warming to witness how many shoppers actually OVER paid us for what they bought, choosing to add a little extra to their deal for the sake of needy critters . We also had several folks grab an image of the URL for buying Hoffman Car Washes to benefit TASP program animals. Is it any wonder why TASP is so proud of our community for how much they care about the animals and people we’re serving? The Mohawk-Hudson River Marathon and Half Marathon were awesome! 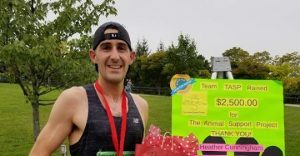 The incredible team of 10 runners who supported TASP with their donations earned over $2,500 for local companion animals! 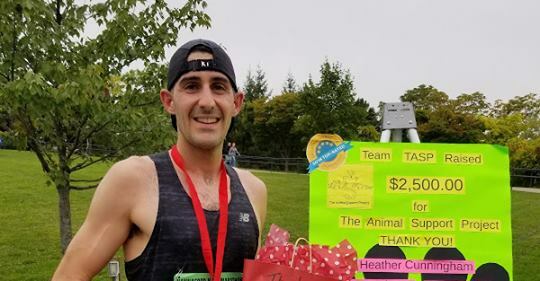 Our sincere thanks go out to Heather Cunningham, Valerie Dias, Paul Joyce, Samantha O’Neil, Michael Polidori, Shannon Popp, Nellie Sandler, Tracy Elston and Kathleen Delaney for their outstanding effort at fund raising for TASP critters! Also, our heartfelt thanks to TASP volunteers who showed up at dawn to help marshal the event. All of these dedicated animal-lovers teamed up to bring much-needed funds to the TASP coffers at a time when demand for services has been exceptionally high. Without their help, we would have had to turn deserving animals away. THANK YOU, everyone, for keeping the TASP torch burning! The 5th issue of The Animal Support Project’s email newsletter is in development, and we’re hoping to get it out to all of you who opted in before the trees lose their autumn leaves. In this edition, you’ll find out how Mitch’s dogs are doing. You’ll meet a couple of TASP volunteers who have been helping out with all four units of TASP’s Incident Command structure: Finance, Logistics, Operations and Planning (better known as FLOP) ;o). And of course, we’re bringing you up to date on all the latest tips, resources, and legal developments concerning companion animals! What’s that? You say you haven’t received a TASP email newsletter yet? Well, then you might still need to OPT-IN. To opt-in, just click on this Opt-In link and follow the ensuing instructions. BTW, please share with anyone you know who might also be interested in receiving the newsletter. Thanks as always for keeping tabs on us. We hope you will enjoy the newsletter as much as we enjoy creating it for you. The fifth edition will be out before you know it! And you won’t want to miss out on the news about Sarah! 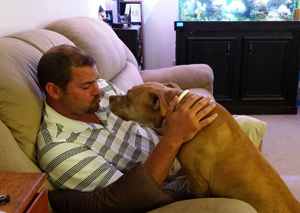 It’s been several months since US Army Veteran, Dan, and his loyal companion, Sheeba, were faced with not being able to pay for Sheeba’s surgery. Take a look at the video below to see how things are going now. ……. and for the back-story, take a look at this video. The Animal Support Project is honored to be one of the beneficiaries of ‘An Act of Dog – Museum of Compassion’ Rescue Rewards program. Artist Mark Barone, in an effort to raise awareness to the fate of so many of our nation’s shelter animals, has created a stunning collection of 5,500 portraits of shelter dogs, illustrating the approximate number destroyed in shelters, every day. Just seeing one day’s worth of faces from the ranks of the innocent animals who are euthanized daily is both eye-opening and inspirational. The “Rescue Rewards” program, is designed to generate money from the creation of beautiful art, using the 5,500 images, and giving back to rescue groups, shelters and animal welfare organizations. 100% of the proceeds raised from the Rescue Rewards program provides immediate assistance to help save as many lives as possible. You can start saving lives today, because every product that you buy, saves a dog or cat’s life. Please visit the website. Consider not only for yourself, but perhaps your family and friends who would appreciate having one of Mark’s beautiful nightlights or artwork for a special gift. Face it – Feel it – Fix it. Thanks for caring! 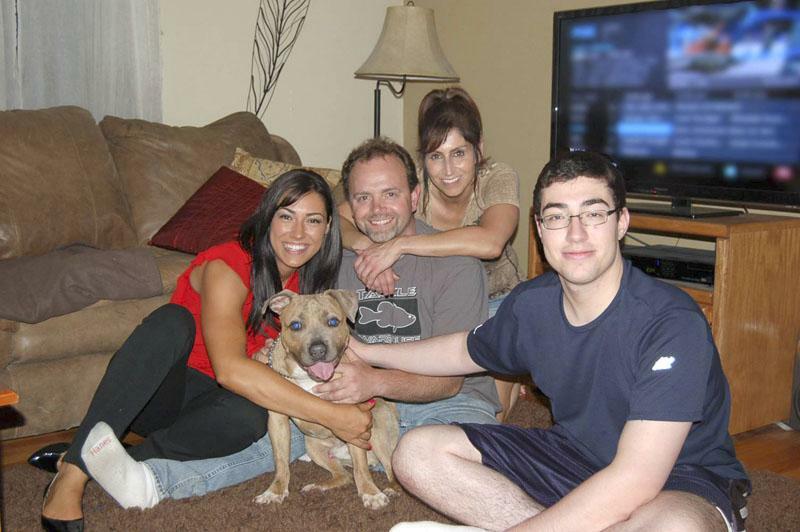 Casey and her family needed help and TASP responded! Tax deductible donations can be made through Razoo or PayPal. Please scroll down to the donation buttons on the left side of this page. Thanks for caring! The Animal Support Project would like to say a sincere THANK YOU to The Pollination Project for the generous grant we were just awarded. The wonderful people at The Pollination Project understand how important our Fantasy Pet Photo fundraisers are for bringing in the cash we need for helping the animals in our community. They granted us enough money to buy a new laptop computer, software and supplies. Now we won’t have to worry about our old equipment breaking down! Did you know that in 2017, TASP spent over $49,000 helping nearly 300 animals who would have otherwise been sent to the shelter or worse? The donations we receive at our Fantasy Pet Photo clinics are a vital part of our fundraising. All proceeds of our photo clinics go 100% to the care of the region’s animals in crisis; allowing us to keep saving needy pets of all species when they need us most. WATCH A VIDEO ABOUT OUR PHOTO CLINICS, CLICK HERE. Visit our Events Calendar page to find the photo clinic nearest to you. For a $10 donation, take home a framed keepsake photo of your pet against one of over twenty different digital backgrounds. Choose the area you are most interested in learning more about. Hey, Everyone! This Cinderella Has Found Her Prince Charming! Hey, everybody! It’s me, Brooke again. Know what? You won’t believe this, but when I was hanging out at the recent Pet Connection Adoptathon at the Van Patten Golf Club, showing off my long down-stays in front of all the cats, the dreamiest guy walked up and started asking questions about what kind of dog he should adopt. 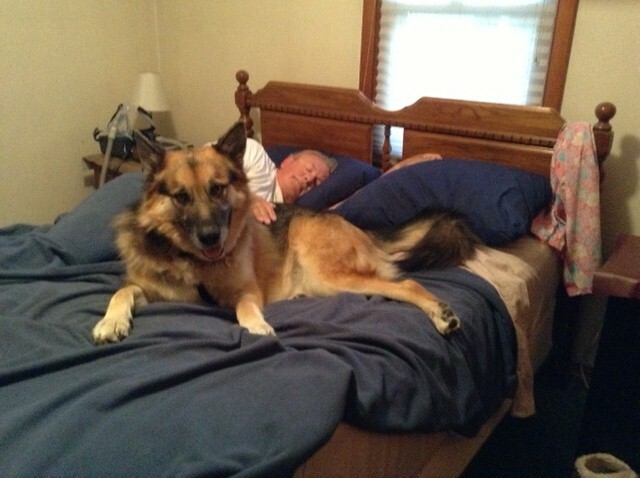 He said he wanted a special dog who would be his forever companion. He wanted a dog who could be happy living in an apartment; someone who was trained, clean and quiet in the home, well mannered and not a chewer….. Do we know anyone who fits that description? DO WE??? So he said he was considering a Labrador Retriever puppy. But when he started learning about what Labrador Retriever puppies need to be happy, he said maybe a Lab’s not right for him. Then he asked about other breeds…..Greyhounds, Boxers, Shepherds, and all the time, I’m sitting there, trying to catch his eye and wondering when he would notice ME! Lying quietly in front of two tables full of cats! For cryin’ out loud, I was the answer to all his requirements! Would he even consider me? After all, for the past year and a half, I haven’t gotten even a single adoption application. I’m like, always the bridesmaid and never the bride, y’know? So all of a sudden, Melinda says (bless her little heart), “Well, THIS DOG,” (me, yeah, that’s right, ME) “has been in training for over a year with one of the best trainers in the country. She’s very clean in the home and not a chewer.” Y’know, I could have jumped right up and given her a big slurpy kiss! But I couldn’t, because she hadn’t released me from my down-stay. So I just lay there, trying not to get my hopes up, all the time, my stomach is doing flip-flops and I’m wishing I’d had the time to dress in one of my provocative outfits for this event……or at least had my nails done! So check it out! This guy starts looking me over and asking all the right questions……and then……..along comes Steve Caporizzo and starts talking to the guy and then another nice man comes along and starts talking to Steve and then that nice man wants to donate a carload of stuff to The Animal Support Project so Melinda and Devin start talking to him AND MY PRINCE CHARMING WALKS AWAY!!!!! Yeah, he walks away and disappears. Meantime, Devin’s getting the van loaded with the wonderful stuff that other nice man donated and Steve Caporizzo moves on to socialize with the others at the event (he’s such a great guy!). And I’m thinkin’, “Oh, well, it was just too good to be true, anyway. But then, just like in a romance movie, Melinda spots Prince Charming talking with someone at another rescue group’s table and she grabs an adoption application and my flyer off our table and she pulls Devin aside and says, “Go give these to that guy we were talking to about Brooke.” So Devin goes over to Prince Charming and hands him the papers and that’s that. Devin comes back, Prince Charming wanders off and I’m back to being the bridesmaid again. Until just minutes before the event is ending, MY PRINCE RETURNS and he asks to take me for a walk. So we walk together past all the other dogs, who, I think, were all teaming up to make me look extra good (I’m sure they all know how long I’ve been looking for a forever home, y’know). They were all barking and lunging and hiking their legs and chewing their leashes while I glided along like a runway model, smoooooothe as a gravy sandwich on a nice loose leash. I showed My Prince a sampling of all the fabulous tricks I can do, all the obedience moves, all the awesome long stays……and then the magic words from My Prince: “Do you have a pen?” Melinda puts a pen in his hands and he fills the application out RIGHT THERE ON THE SPOT! The rest of the story is like the happiest ending in your favorite fairy tale. It’s me, Brooke. And I thought maybe some of you would like an update on what’s up with me these days. Well, after a year of training and behavior work in my foster home, I guess you could say I am a well-developed little lady. I’m three years old now. Bubbly and goofy during play & snuggle times, I can turn on the work-mode with just a word from you. Wanna see me do my long sits? Or my down-stays? Or my nosework, agility or rally obedience moves? Wanna see me heel, or roll over? I’m not ruled by my emotions anymore and my past life of running the streets after Hurricane Sandy seems like it must have happened to someone else, not me. Today, I am a thinking dog. When a challenge comes along, I look to my person and ask them what they want from me. I’m into relationships now, not distracted anymore by the things that shouldn’t concern me. I’m ultra clean in the house. I don’t chew furniture or shred the bedding like some dogs might do and I never, ever do my business in the house. I’m spayed, microchipped, vaccinated and so well educated, I think I could maybe even balance your checkbook! In my present condition, I’m ripe for finding a real home of my own. I’ve got so much love to offer and there’s so much fun to look forward to! We could drive to the pet shop and I can demonstrate my “leave-it” command as I pass by the pig ears and rope toys. We could hike in the forest together, and maybe invite some friends to come along. I love dressing up…..I’ve even got my own bikini! I love hugs from strangers, riding in the car, sharing a spoon of ice cream, hunting for kibble under the furniture and stretching out for belly rubs. I adore picking apples in the fall and wrestling with sturdy, friendly dogs my size. And although I am now trained to leave cats and small animals alone, even if I am sitting right next to them, would it be ok if my new home didn’t have those? Their size and movement patterns make it so hard for me to resist chasing them! You know, it would break my heart if I accidentally disappointed you. Made possible by a grant from ASPCA. 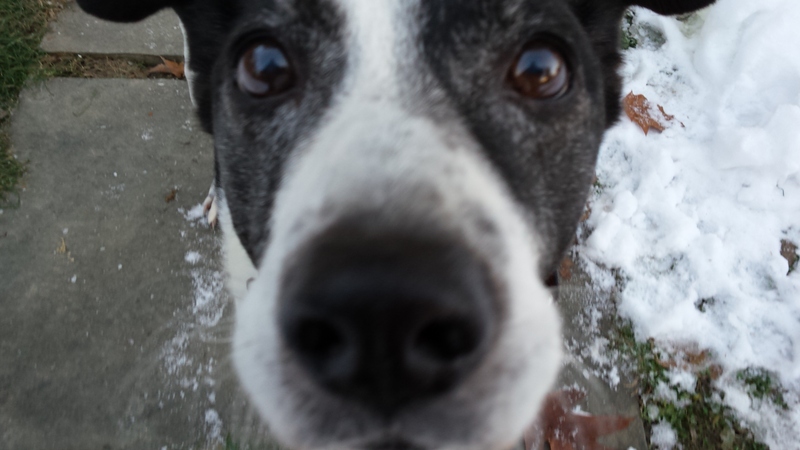 Szula’s recovered SO WELL after her elbow was rebuilt at Veterinary Specialties! Thanks to everyone who donated to Szula’s cause and also to all of you who prayed for Szula’s recovery. Just take a look at her during her 2-week review with Dr. Fitzpatrick………. 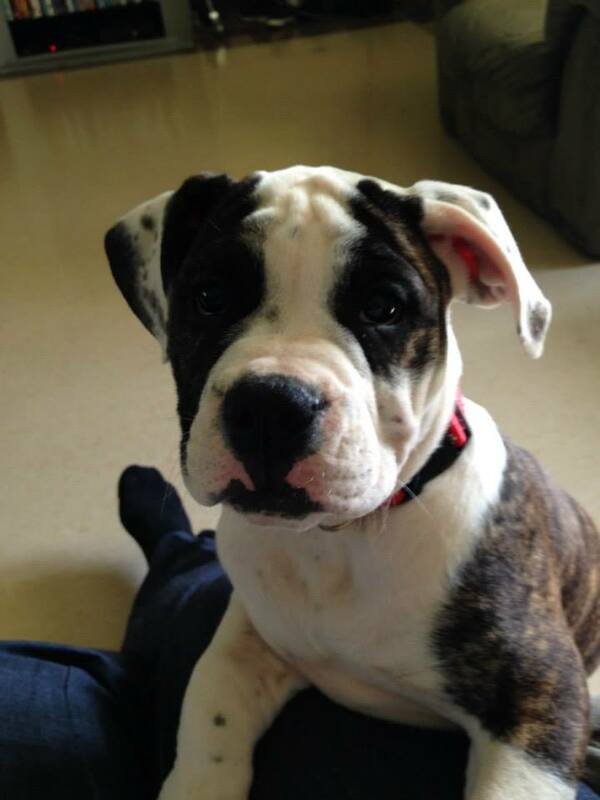 Szula’s Back-story: This little 3.5 month old English Bulldog pup is Szula. She was playing a couple days ago in her fenced yard in Amsterdam with the other two dogs who live with her, when some miserable loser decided to try stealing her. While the perpetrator was trying to get her out the gate, the other two dogs rushed him and he slammed the gate on Szula’s left front leg, BREAKING HER ELBOW COMPLETELY! 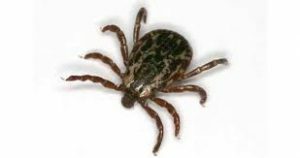 Szula’s owner, Eric, rushed her to the vet where for $300, they gave her a couple of laser treatments and told him that Szula only had a pinched nerve. A day later, when she was still in pain and not using the leg, Eric took her to the emergency hospital for $600 worth of diagnostics, including X-Rays. That’s when he found out that Szula’s leg was broken. A trip to Dr. Glennon followed, where an estimate of ~$3,000 for surgery to rebuild Szula’s shoulder was provided. Eric’s not working; in fact, he’s preparing for his own upcoming surgery. 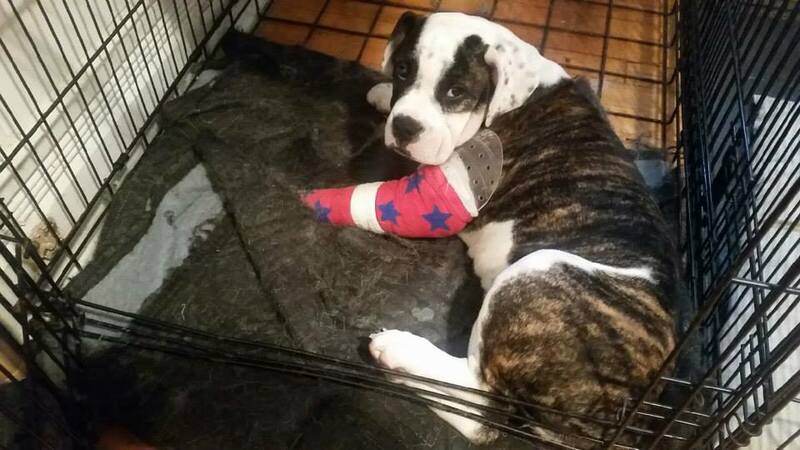 He’s already in hock for the $900 he’s spent in trying to diagnose his puppy’s injury. The perp got away and the authorities are still trying to find him. Dr. Glennon says if Szula can’t receive her surgery by Tuesday, then he’s recommending euthanasia. SZULA UPDATE AS OF 7PM, JULY 8: Eric got discouraged over the weekend when he was only able to scare up around $300 in pledges through Onyx and Breezy Foundation and Guilderhaven. So he did not make his appointment with Dr. Glennon until I talked with him this afternoon. To date, Dr. Glennon’s office only provided a verbal estimate based on the phone call Eric had made to them back on July 3. But now Szula actually has a consult scheduled with Veterinary Specialties Referral Center for tomorrow, July 9. Either Dr. Glennon or Dr. Fitzgerald will review the tests and x-rays Eric’s already done and from there, they will make their recommendation. Stay tuned for tomorrow’s update, likely in the late afternoon. Meantime, please pray and send your best energy to Szula and her Dad and to the doctors who will be reviewing her case tomorrow. SZULA UPDATE AS OF JULY 9: Eric just got back from Veterinary Specialties Referral Center. Dr. Fitzgerald says if Szula can’t get her surgery by Friday, then she should be put down. Please network like crazy so that we can get Szula the surgery she needs. This poor girl should not have to euthanized. Anyone wishing to donate to this surgery can submit a PayPal donation via Veterinary Specialties Referral Center in Pattersonville, NY’s website. 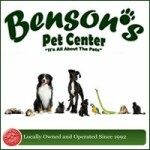 On the right hand side of the home page, click on ‘For Pet Owners’. When that page loads, on the left hand side, click on ‘Financial Assistance’. 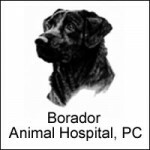 Fill out the form, including the required fields; the pet owner’s name is Andres Robles, the client id is 16295, your email address, the pet’s name is Szula and the amount of your donation. Then hit submit. On the next page click ‘Pay with PayPal’ to complete your PayPal transaction. If you have questions, Dr. Glennon’s office can be reached at 518-887-2260. Thank you so very much for your donation. Together we can get this little girl the lifesaving surgery that she needs. No donation is too small. Every little bit helps. 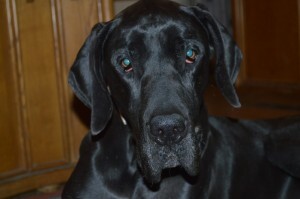 As many of you know, Hoss did not live to spend all the funds that were donated for his medical needs. 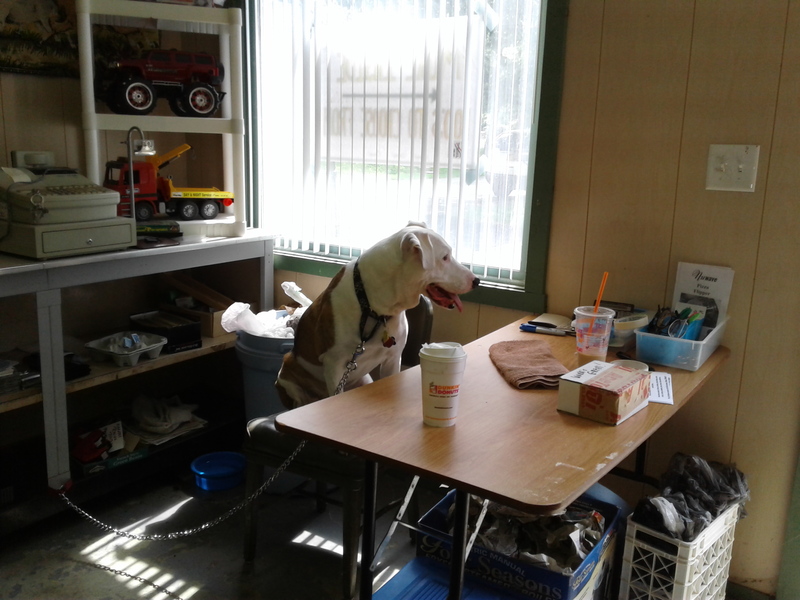 As of this date, after paying for his X-Rays, vet visits, euthanasia and cremation (his food and his giant foam bed were paid for by TASP and his foster family), the Hoss Fund contains enough money for TASP to keep the account open, to be officially turned into a memorial fund for giant breed dogs in crisis. Hoss was generous in size and in soul and his memory can be appropriately honored and immortalized through offering help to other giant breed dogs who, like him, need special assistance to prevent their suffering. Anyone who wishes for their donations to be specifically applied to this purpose is welcome to do so through the Hoss Fund, by simply adding a note on their check, letter, Paypal or Razoo donation, indicating it is for Hoss’s Fund. As always, 100% of all donations will be applied to the animals, as we are a 100% volunteer organization. Thanks for caring about Hoss and for all the giants yet to come. To date, The Hoss Fund has helped save THREE giant breed dogs: 214lb. Tinkerbell, big, beautiful Izza, and service dog, Maia. All are adult female English Mastiffs who were in need of veterinary care. TASP teamed up with Guilderhaven to help Izza, since her condition was extremely serious. Maia and her owner are back up and on the move again, thanks to Hoss’s contribution to the vet care she needed. Happy to report ALL these generously proportioned ladies are now recovered and Living Large with their families! Wouldn’t Hoss be proud? Students from Rensselaer Polytechnic Institute’s Acacia Fraternity provided the manpower this month, helping The Animal Support Project (TASP) erect a secure 2,000 square foot outdoor canine training yard. The yard, constructed primarily from welded steel kennel panels obtained through a grant from The American Society for The Prevention of Cruelty to Animals (ASPCA), will be used for humanely treating behavior in TASP program dogs through positive training and controlled behavior modification methods. 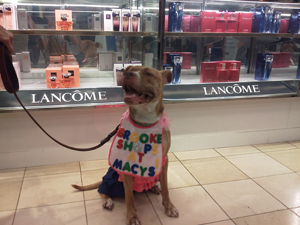 The ASPCA grant was awarded as part of a continuing commitment to Brooke, a dog rescued by TASP from ASPCA’s Hurricane Sandy Temporary Emergency Boarding Facility in Brooklyn, NY. In addition to Brooke, the training yard will offer a legacy of support to TASP program dogs needing behavioral adjustment in order to adapt to home and family life. 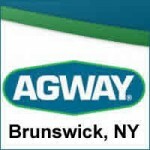 ASPCA Behaviorists and Crawmer’s Animal Training of West Sand Lake, NY, will provide guidance to TASP volunteers operating the yard program. Police: Two arrested in Bethlehem for animal abuse. Horses found allegedly mistreated and malnourished. Monday, November 11, 2013 -3:57 p.m.
Bethlehem Police Department executed a search warrant at 80 Waldenmaier Road on Monday, Nov. 11 as a result of a multi-week investigation into complaints of animal cruelty and neglect of horses. Police said upon arrival to Stone Brook Farms, 33 horses were found on the property. After an investigation, some horses were allegedly found to be in various stages of neglect and malnourishment. Others were allegedly found to be without water. All horses were examined by licensed veterinarians and as a result of the examinations eight horses were seized to undergo further evaluation, treatment, and care. Police said the seized horses will be stored at another location until further ordered by the Town of Bethlehem Court. As a result of this investigation, Karen A. Burrows, 49, and William J. Trianni, 25, both of 80 Waldenmaier Road, were arrested and charged with eight counts of failure to provide sustenance, a Class A misdemeanor under the New York State Agriculture and Markets Law. Both subjects were released on appearance tickets and are due to return to the Town of Bethlehem Court on December 3 at 4 p.m. Volunteers from TASP were called to the scene to help police and the horses. The Animal Support Project has met the eligibility criteria and Program guidelines to be part of the “GE Foundation Matching Gifts Program”. 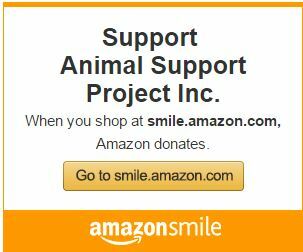 So if you are a donor through that program please select “The Animal Support Project” as your choice for matching gifts. Thank you. Hi, my name is Rosie. TASP was honored to have cared for this wonderful little senior beagle, making the last chapter in her life as good as it could possibly be for her. After being struck by lightning in July of 2013 while tied to a steel cable in her former home’s yard, Rosie’s external injuries eventually healed. But the damage her kidneys suffered from the trauma could not be reversed and eventually claimed her on May 15, 2014. 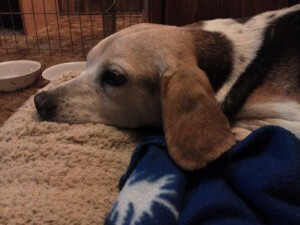 Throughout those ten months, Rosie lived in TASP foster/hospice care with other animals and people who adored her. She never let her past inhibit her sense of joy for living or her gentle disposition toward everyone she met. 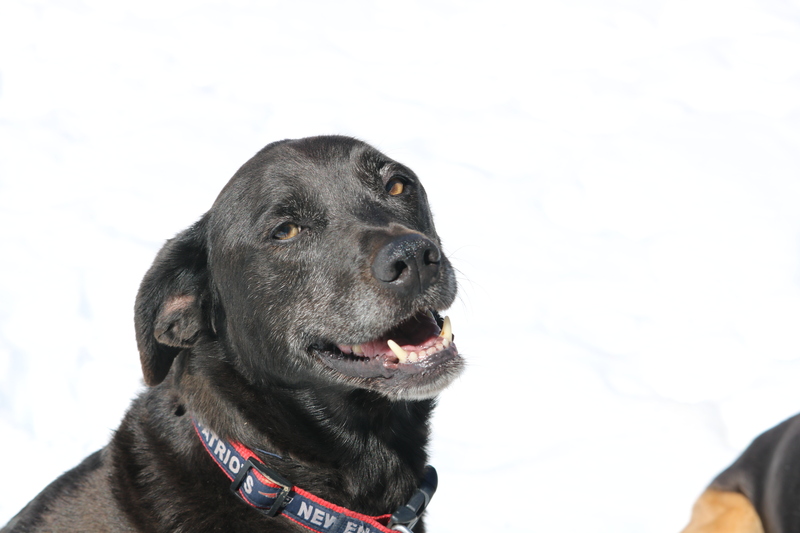 Every day, she enjoyed the best in veterinary care, wholesome food and exercise. 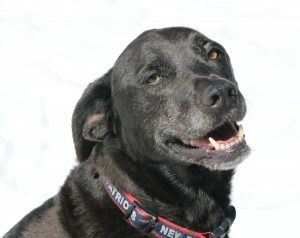 She had her own thermal beds around the house to keep her warm through the winter and in spring, she enjoyed hunting for bunnies under the shrubs in the yard with the other dogs. Rosie’s last days were spent quietly enjoying the beautiful yard and the cozy trailer at George Kautz’s place, where she, Patches and Buttons could peacefully take in all God and TASP could offer. We can only imagine the wonderful time she is having in the afterlife with all the wonderful people and animals already passed over the bridge, who surely greeted her upon her arrival. Rosie in her foster home. “Without my TASP foster family, I’d still be existing on the chain instead of sleeping on the bed. CROPSEYVILLE — The Animal Support Project has a 2-year-old pit bull up for adoption after it was found without a home during the aftermath of Hurricane Sandy.